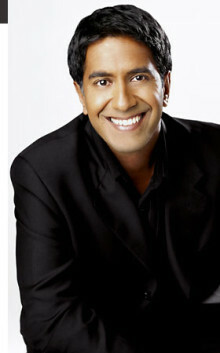 Dr. Sanjay Gupta is senior medical correspondent for the health and medical unit at CNN. Gupta, a practicing neurosurgeon and an assistant professor of neurosurgery, plays an integral role in the network’s medical coverage, which includes daily packages, the half-hour weekend show House Call with Dr. Sanjay Gupta and coverage of breaking medical news. Based in Atlanta, he also co-hosts Accent Health for Turner Private Networks, provides medical segments for the syndicated version of ER on TNT, contributes health news stories to CNN.com and writes a column for TIME magazine. Gupta joined CNN in the summer of 2001 and became part of the network team covering the Sept. 11 attacks in New York City. Breaking news about anthrax and its deadly effects highlighted Gupta’s coverage. In 2003, Gupta spent time in Iraq and Kuwait, reporting on various medical aspects of escalating tension with Iraq. During the war in Iraq, Gupta reported as an embedded correspondent with the U.S. Navy’s medical unit, the “Devil Docs.” He provided viewers with exclusive reports from points along the unit’s travel to Baghdad and provided live coverage from a desert operating room of the first operation performed during the war. Gupta also performed brain surgery five times. Additionally, Gupta’s coverage appeared in a one-hour CNN Presents documentary, and he will serve as executive producer on an upcoming TNT original movie in development about the unit. Besides his battlefield medicine coverage, Gupta also reported from Kuwait immediately after a low-flying missile hit a Kuwaiti shopping mall. In 2004, he traveled to the international AIDS conference in Bangkok, Thailand, where he reported on the pandemic for CNN/U.S., CNN International and CNN Headline News. In December 2004, Gupta was sent to Sri Lanka to cover the disaster and aftermath of the tsunami that took more than 155,000 lives in South Asia. He also introduced “New You Resolution,” the first installment of prime-time, health-related specials Gupta produces for the network. Following “New You Resolution,” he anchored “Life Beyond Limits,” which explored individuals who push their bodies to extremes. Gupta’s subsequent specials “The First Patient: Health and the Presidency” and “Are You Positive?” addressed presidential health and AIDS. His next special in 2005 will look at memory. In addition to his work for CNN, Gupta is a member of the staff and faculty of the department of neurosurgery at the Emory University School of Medicine in Atlanta and performs surgery weekly at Emory University Hospital and Grady Memorial Hospital, where he serves as chief of neurosurgery. Before joining CNN, Gupta was a neurosurgeon at the University of Tennessee’s Semmes-Murphy clinic, and before that, the University of Michigan Medical Center. He became partner of the Great Lakes Brain and Spine Institute in 2000 and in 1997, he was chosen as a White House Fellow, one of only 15 fellows appointed. He served as special advisor to the first lady. He is a member of several organizations, including the American Association of Neurological Surgeons, Congress of Neurological Surgeons, Do Something Foundation, Healing the Children Foundation, the Council of Foreign Relations and the Brain Foundation. Gupta is also a certified medical investigator. Gupta received his undergraduate degree from the University of Michigan and a doctorate of medicine from the University of Michigan Medical Center. Do you want to hire Dr. Sanjay Gupta? Directly request a quote. In 48 hours we can send you the availability of Dr. Sanjay Gupta If you would like to book Dr. Sanjay Gupta, Entertainment Booking Agency is the right place. We will offer you the best price and contact the management or we directly contact Dr. Sanjay Gupta. For corporate appearances or speaking engagements you can contact our agents and the will help you true the process. Tags: hire Dr. Sanjay Gupta, Dr. Sanjay Gupta booking, book Dr. Sanjay Gupta, Dr. Sanjay Gupta appearances, find more information on booking Dr. Sanjay Gupta for appearances, Dr. Sanjay Gupta speaking engagements, Dr. Sanjay Gupta endorsements/spokesperson, Dr. Sanjay Gupta appearance fees, Dr. Sanjay Gupta booking agency contact info, biography of Dr. Sanjay Gupta, Contact an artist booking talent agent find a speakers bureau that can book Dr. Sanjay Gupta, speaker booking agency for Dr. Sanjay Gupta, Dr. Sanjay Gupta booking agency, Dr. Sanjay Gupta booking for corporate event. EBA is one of the biggest entertainment booking agencies in the World. We book hundreds of celebrities, artist, athletes and speakers in a year. Important to know is that we are not claiming to be the management of Dr. Sanjay Gupta. We are not the official agent for Dr. Sanjay Gupta. Companies from around the globe book these artists and speakers true our company be course we have one of the biggest networks and we always have direct contact with the artist or the management. We help you to find the right celebrities for your corporate of private events. Please contact one of our agents to get free advice and we will help to get the world-famous artist on your party.